Learn Why Killer Product's Dont Sell and What you can do to change it! Join Mark Gibson for this two part Video Whiteboard Webinar to introduce core concepts from the book "Why Killer Products Don't Sell" by Dominic Rowsell. 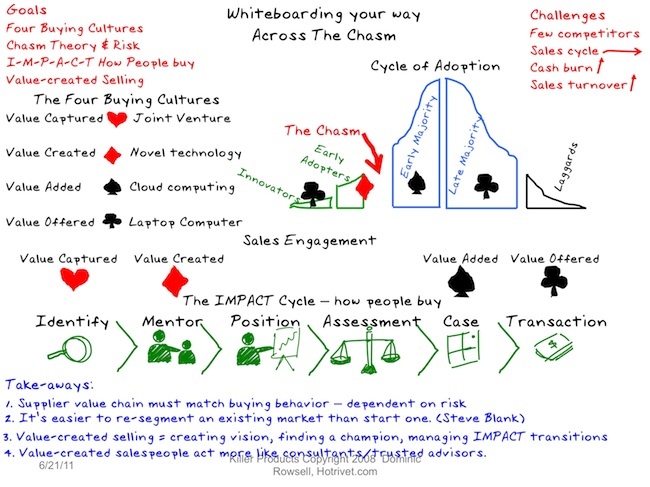 Covers the four buying cultures and the IMPACT Cycle - how companies and people buy is dependent on their tolerance for risk. Value-created Selling is how to sell early adopters so you can get your "killer-products" sold. It is also critical for selling services based engagements. CSO Insights Sales Performance Optimization Survey places aligning with customer buying process as a top 5 initiatives for sales leaders. Find out if you are selling to customers in the way they wish to buy, based on their risk profile and the maturity of your product in the market. Learn how to engage buyers earlier in the sales cycle with Value-created Selling.